When I first came to the United States in the mid-90s, I knew that the food in the college cafeteria and the three local pink-and-gold gaudy Indian restaurants would be different from the food that I had grown up on. More than my daily meals, I missed the tangy and spicy street foods that are served in various corners of Calcutta. 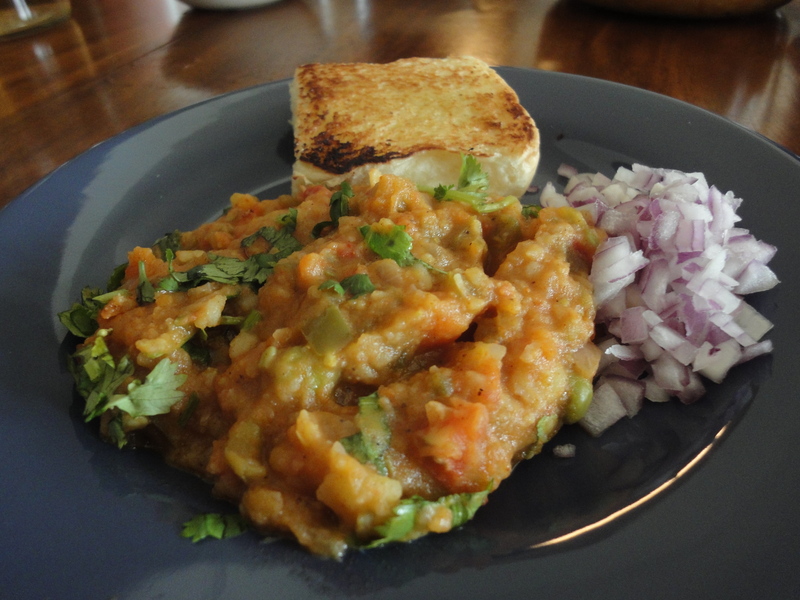 Pav bhaji, a hot mixed vegetable curry served with bread, was one such dish. My memories of pav bhaji consisted of first evading my mother who didn’t approve of street food, and then finding the pav bhaji vendor on a noisy and busy street corner in the early evening. The pav bhaji man was dark, thin and intense, with a big moustache. “How spicy would you like the bhaji, didi, and should I put everything?” he asked in Hindi. While I waited, he sizzled a pat of yellow butter on a giant round black griddle or tava. He threw in diced onions, peppers and ginger-garlic paste into the middle of the pan and added some chopped tomatoes and mashed potatoes. His face shone by the light of the naked bulb suspended overhead and his hands moved deftly, wielding the steel spatula with practiced skill as he sprinkled a generous spoonful of garam masala, a mixture of black pepper, cinnamon, clove, cardamom, cumin and coriander powder, tossed in some amchur or dried raw mango powder, and spiced up the bhaji with red chilli pepper powder. Finally, the bhaji man scooped up the thick piping hot curry onto a crackling plate made of dried leaves, added another generous dollop of butter and a sprinkle of lime, topped the bhaji with crunchy chopped onions and bright green cilantro, and served it with a side of hot buttered rolls or pav. When I took a bite, my mouth puckered at the taste of the piquant and spicy concoction. The roll provided a marvelous antidote to the fire in the bhaji, and I experienced a glorious sense of wellbeing as the hot food slid down my throat and reached my belly. This is what I craved: a hot satisfying one-pot meal that would taste of the jostling streets of home. Meanwhile my roommate who had grown up with Chinese immigrant parents in Brooklyn was also experiencing a similar food crisis in the cafeteria. She had her mother bring us each an electric sauté pot. Using such devices in our wood-paneled and cramped dormitory rooms was completely against fire marshal rules. We were in an old and prestigious college, and cooking food drawn from Calcutta’s underbelly in these hallowed halls seemed somewhat sacrilegious. But we were desperate. The pav bhaji undertaking began with a phone call to my mother. I had never cooked anything, ever. But pav bhaji turned out to be a forgiving dish and one that was hard to botch. The onions could be a little undercooked, since raw onions were added for flavor on top anyway, and the tomatoes didn’t have to be necessarily cooked until the butter rose to the surface, since the dish was supposed to have a tart flavor. Potatoes could be boiled and mashed in preparation. The dry spice mixture, pav bhaji masala, came in a prepackaged box, and could be added to the dish to taste. Generous chunks of butter masked any other shortcomings. I still remember my first dorm-cooked pav bhaji, laying magnificently at the bottom of the black plugged-in cooking pot. The smell of frying onions and masala had wafted and filled the building, perhaps suffocating the inhabitants along the way. My first few attempts yielded a bhaji that was fairly edible despite some noticeable shortcomings in flavor. It’s been thirteen years since that first year in college, and my memories of pav bhaji are now entwined with growing up and settling into the United States. My first attempt at cooking. The first dish I made for my husband, and that he has grown to crave as well. And one that my two-year old now comes to inspect by dipping tiny bits of bread into the edges of the spicy bhaji on my plate and scooping them carefully into his mouth. 1. In a pressure cooker, place the potatoes, peas, carrots and cauliflower florets. Add about 1 cup of water, or enough to just submerge the vegetables. Bring the pressure cooker to 1 whistle on medium heat. Remove from heat, mash the boiled vegetables gently with a potato masher in the pressure cooker itself and set aside. 2. Meanwhile, heat the butter in a pan, and add half the onions and ginger. Fry on medium heat until the onions turn brown. Add the tomatoes, and cook until the oil separates from the paste. 3. Add the cooked onion-ginger-tomato paste to the boiled and mashed vegetables in the pressure cooker. Add the pav bhaji masala, red chilli powder and salt. Cook on medium heat for several minutes, until the mixture appears well integrated and thickens slightly. Add lime juice to taste. Remove from heat. 4. Garnish with the chopped coriander. Serve piping hot with a side of split, buttered and pan-toasted soft bread rolls, the remaining chopped red onions and slices of green lime. Welcome to the blogging world! I enjoy Indian food very much. Two of my closest friend growing up were Indian and I loved eating at their houses! I was raised vegetarian and both of their mothers cooked food that was safe for em to eat. I’m looking forward to trying some of your recipes. Thank you! I would love your feedback, and would be happy to provide any clarifications.